As I mentioned in last week's NTT post, I've been working on making a baby quilt from the small scraps of my Secret Lagoon quilt. I didn't have many scraps, so I decided to use them to make a minimal quilt, and I used improv sewing to make the most of them. When I took the photos of this one, the sunlight really threw the seams into high relief. Crazy, because they are practically invisible in person (and I promise that they are straight!). I wasn't sure how I was going to layout these improv HST's, so I cut several solid squares to fill out the quilt, giving myself plenty of layout options. If I had planned a little better, I would have used large sections of the background fabric rather than using squares, but once they were cut, I certainly wasn't wasting them. My larger leftover chunks made a perfect backing, and I used more of the lighter shade of navy marble fabric to bind it. I definitely have a to-do list right now, but with all of the other madness happening in my house, a little whimsical improv sewing was just what I needed to decompress. 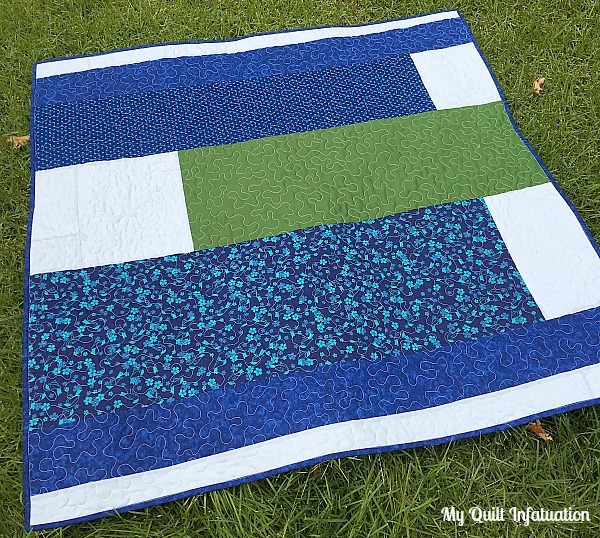 The design of this quilt reminds me of the disturbance created when stones are tossed into a peaceful body of water, so I thought that Ripples was an apt name. Congrats! on your newly completed quilt. I agree with the zen feeling brought about by improv sewing. It is SEW perfect when needing to decompress! 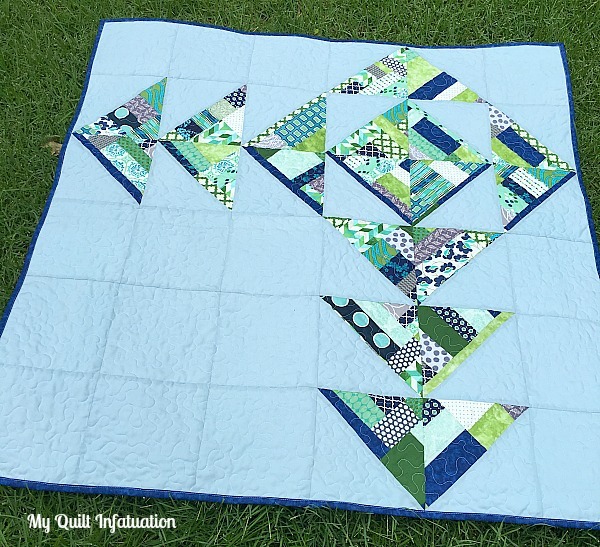 A great improv quilt! I hope things get better in your house soon, what a headache! Very effective layout! Great use of your scraps. Kelly, I love your improve HST's! Truly a cool layout, rippling water yes . The darker blues are placed just right and the binding in navy marble really pulls those out. Thank you for sharing. I like the blocks better that large sections of background fabric. Great quilt! Beautiful, I love the minimalism aspect of the quilt. Superb design and the "made fabric" is one of my favorite techniques. Great use of left overs. Love the colors. The name really fits, the pattern does look a lot like ripples in a pond. What a pretty quilt! These colors are perfect together and really pop against the light background fabric. Don't you just love that moment when you realize how much extra work you gave yourself? It works great here. The solid blocks give a sense of where the improv blocks might have been.